Memories- A Waterfront Vacation Home. This charming 2 bedroom, 1 bath lakefront home is your perfect getaway place, whether its a romantic week alone or a family trip. 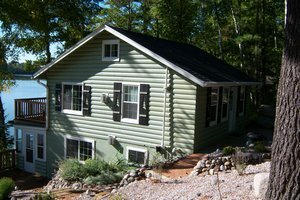 Located on beautiful 980 acre Little St. Germain Lake, this completely refurbished home is loaded with top quality brand new furnishings throughout including plasma tv's, surround sound, CD/DVD player and washer/dryer. In addition, this home also boasts two custom fieldstone gas fireplaces, one of which makes for a cozy master bedroom. Private dock allows for use of the 195' of pebble shoreline. Snowmobile trails are literally at your door. Little St. Germain Lake max depth of 53'. 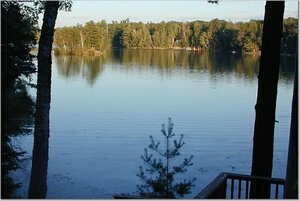 Muskie, Pike, Walleye and Pan Fish are common in this highly reputable fishing lake. You will fall in love from the moment you enter! (Weekly rentals are Saturday to Saturday) Available all seasons. Check-in time is 3:00 p.m. on the Saturday of your week and check-out time is 10:00 a.m. on the following Saturday. Rates quoted are in U.S. Dollars.